The 2017 peony season is wrapping up. I know. I’m devastated, too. But I know it’s short-lived. 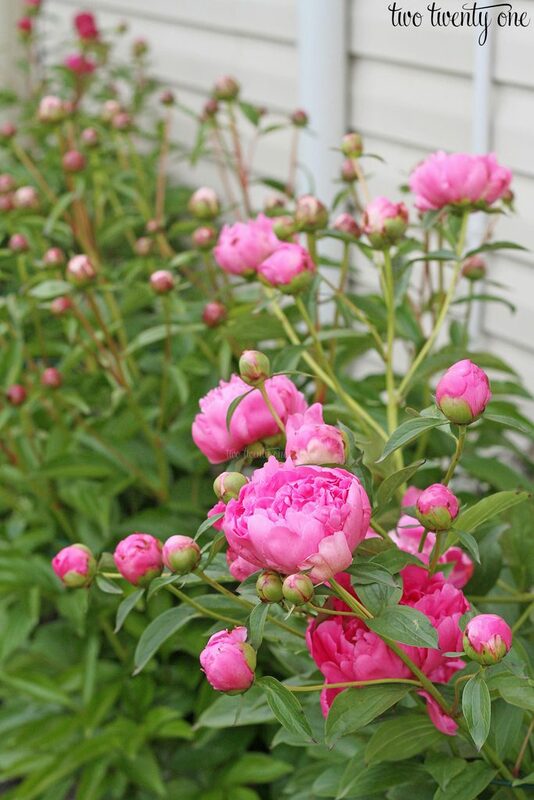 Peonies aren’t known for their lengthy blooming period. 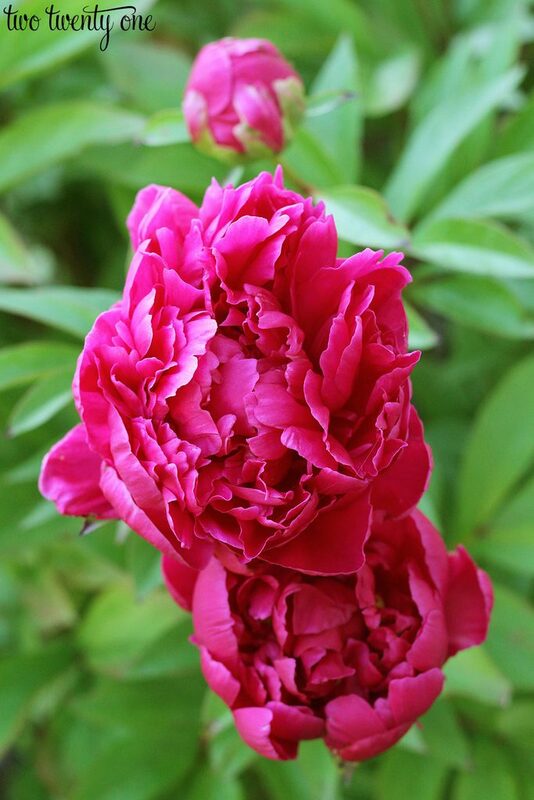 Every year I typically do two posts on the #221peonies, but I decided to just give your scrolling finger a work out and do one, lengthy post. Don’t worry though- it’s heavier on photos than text. 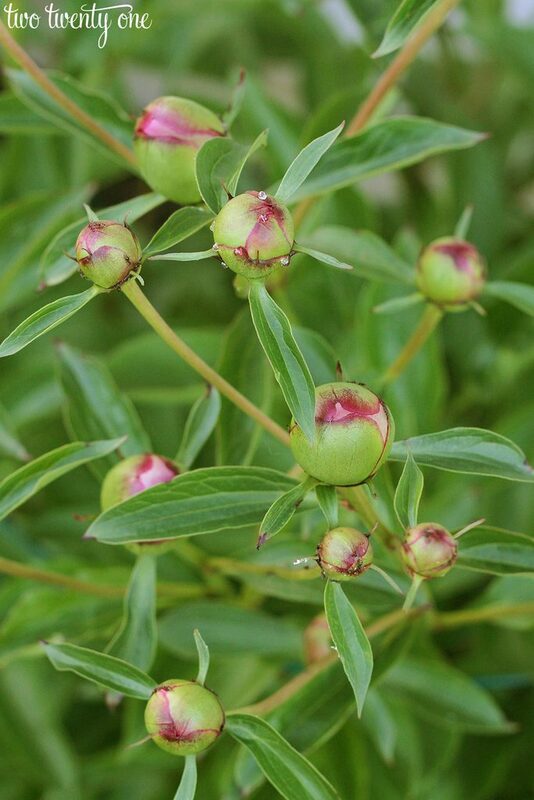 Before I go any further, if you want to know more about growing peonies, please read THIS POST. But as time goes on, they get cuter. Like when babies gain a couple pounds and start to chunk up. Those aren’t water droplets. 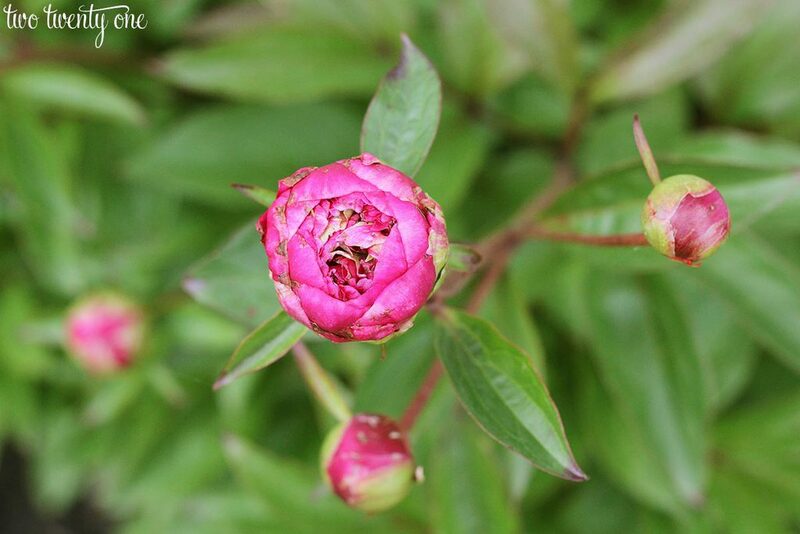 It’s nectar that’s produced by the peonies. It’s also what ants are attracted to. 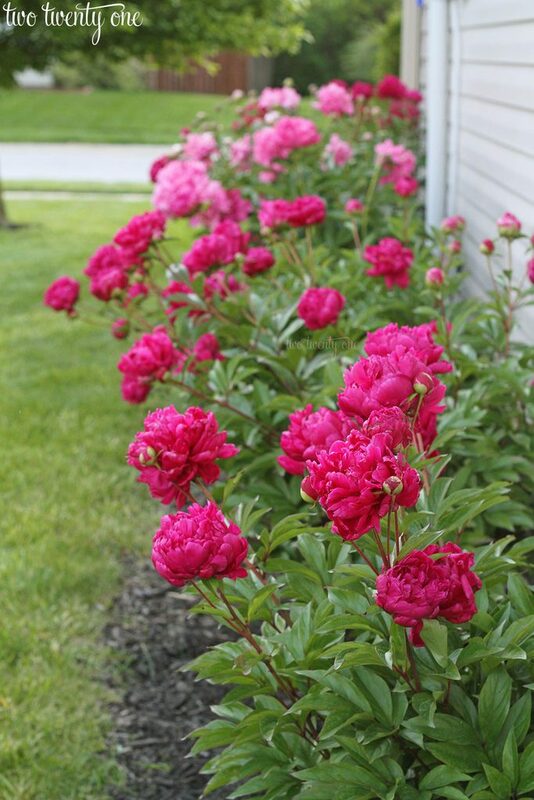 I have 8.5 peony bushes that line the south side of our house. I say .5 because one didn’t do too hot this year (or last year). So I’m going to dig it up and plant it higher to the surface. We had A LOT of rain this spring. 5.6 inches in April and 6.22 inches so far in May. 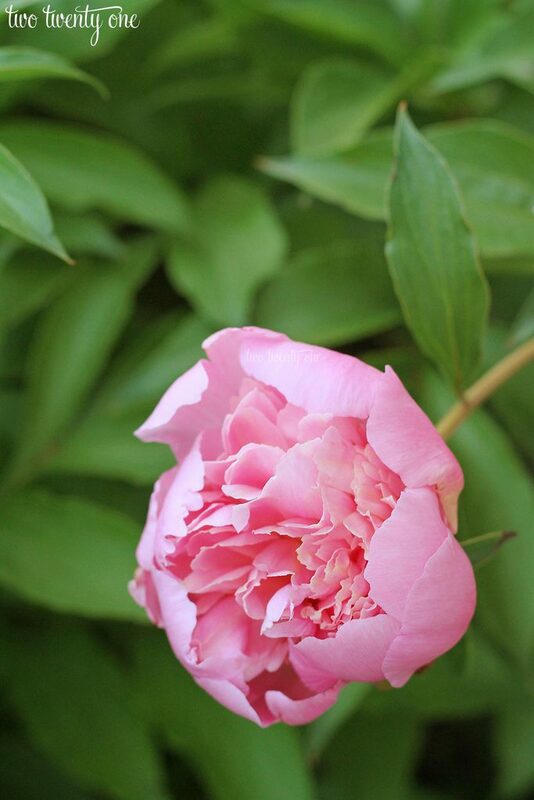 This is the first year in the 8 years that I’ve grown peonies here that the rain has affected the peonies. A lot of the blooms have petals tipped in brown. Other blooms rotted before even opening. It was really unfortunate, but there wasn’t much I could do about it. 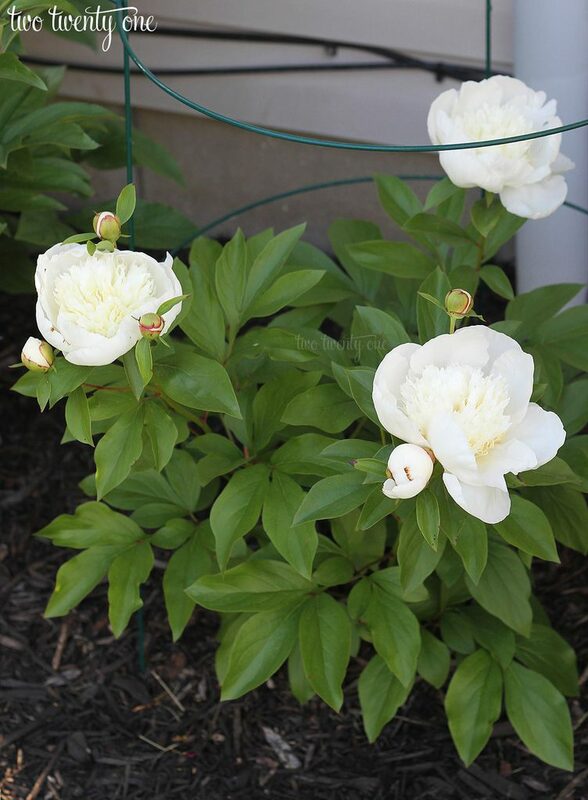 My white peony bush produced buds for the first time this year. You can see the speck of brown on the petal– a result from all the rain. 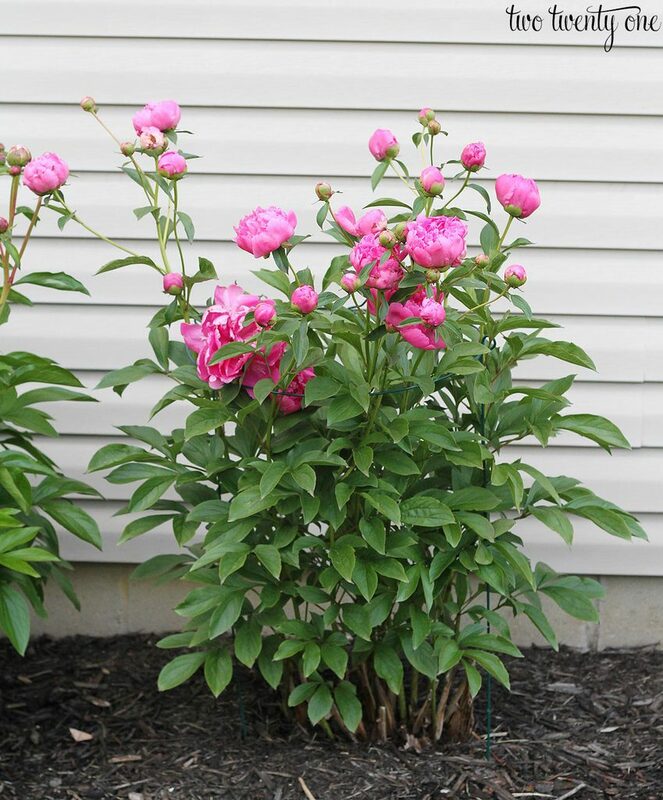 Every year, my first peonies to bloom are on the plant my parents’ divided from one of their mature plants and gave to me back in the fall of 2009. 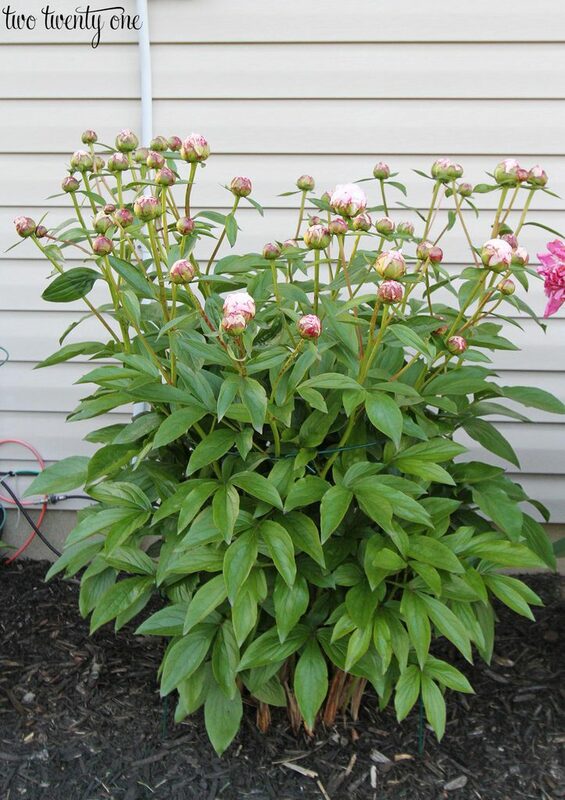 It’s also my largest plant– stretching over 6 feet wide. It always produces tons of blooms. 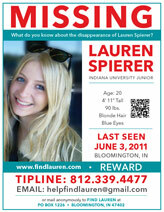 This year, it had close to 100. If you follow my Instagram Stories, you’ll know that I deadheaded 70 blooms off of the plant one evening. 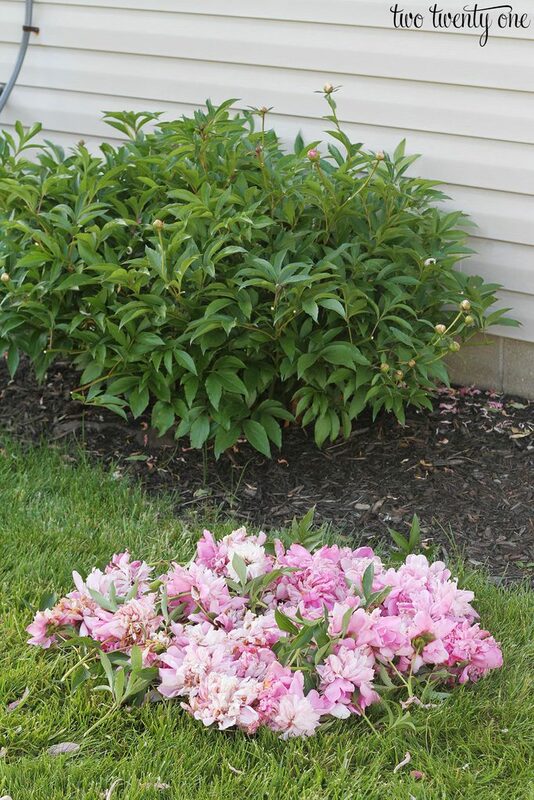 You can read more about deadheading here. 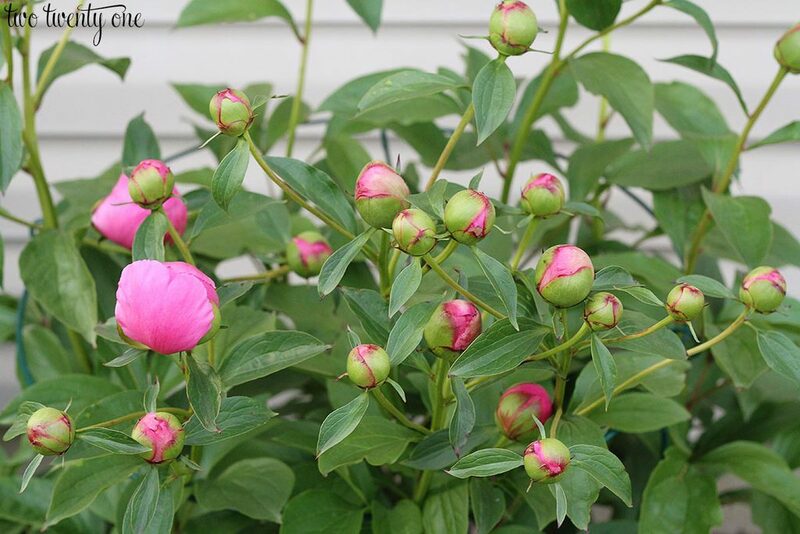 The blooms from this plant are the most fragrant and the prettiest shade of pink. 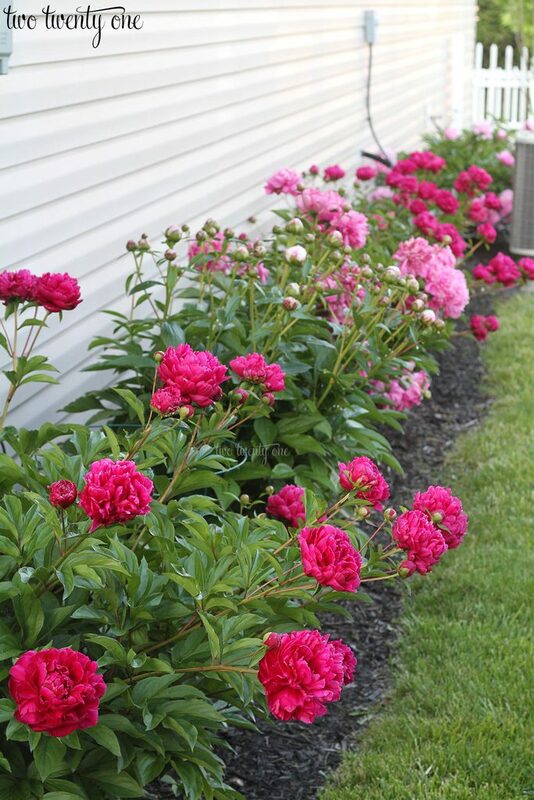 I love looking down the row of peonies when most of them are in bloom. Back in April, I shared how a few of the plants were getting a little added support in the form of cages. 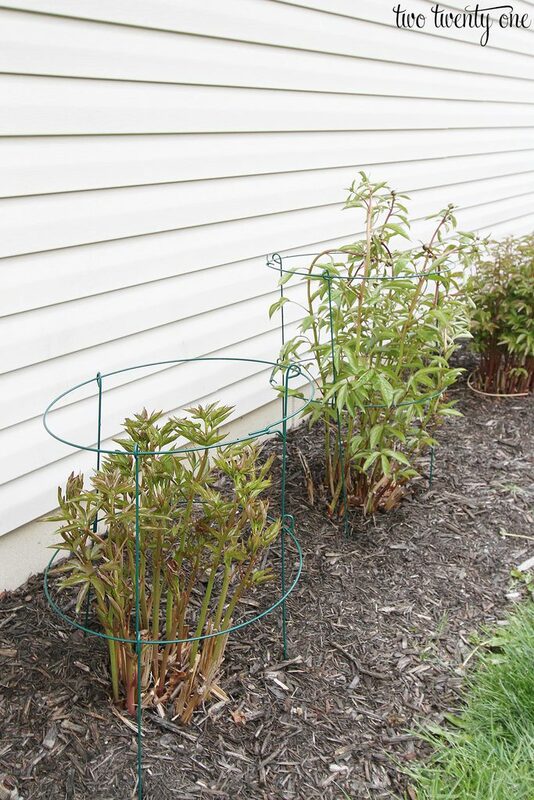 The peony support cages worked out really well for the most part. I may have to look for 3-ring supports next year though. 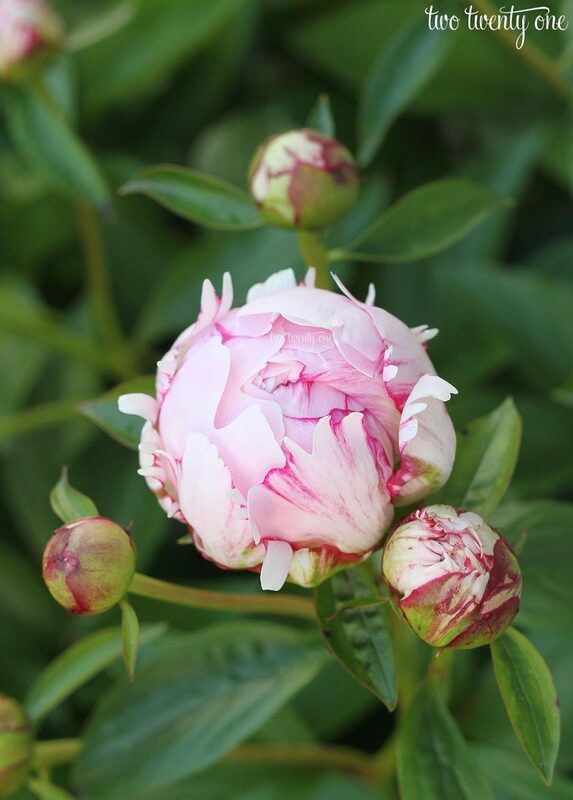 One of my last plants to bloom is the only one I’ve been able to identify– the Sarah Bernhardt. The blooms are giant– the largest are 6-7 inches in diameter. They’re also mildly fragrant. 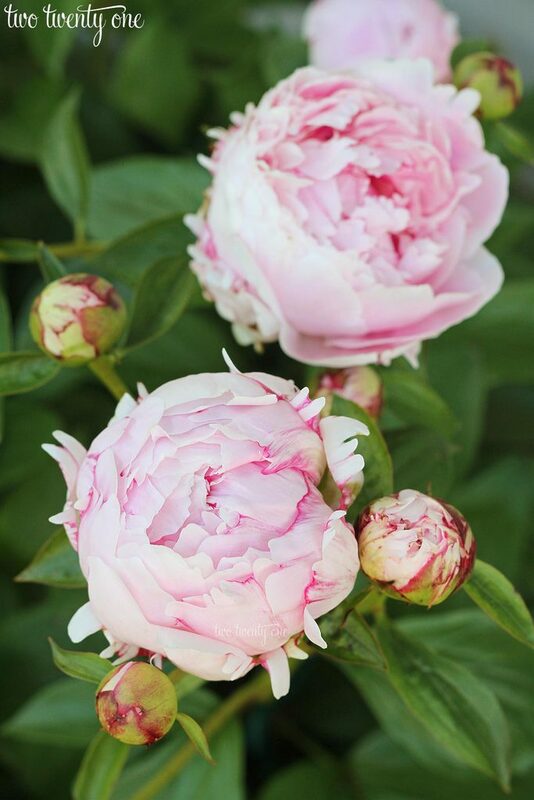 I love the pale pink petals, which are tipped with a darker pink. 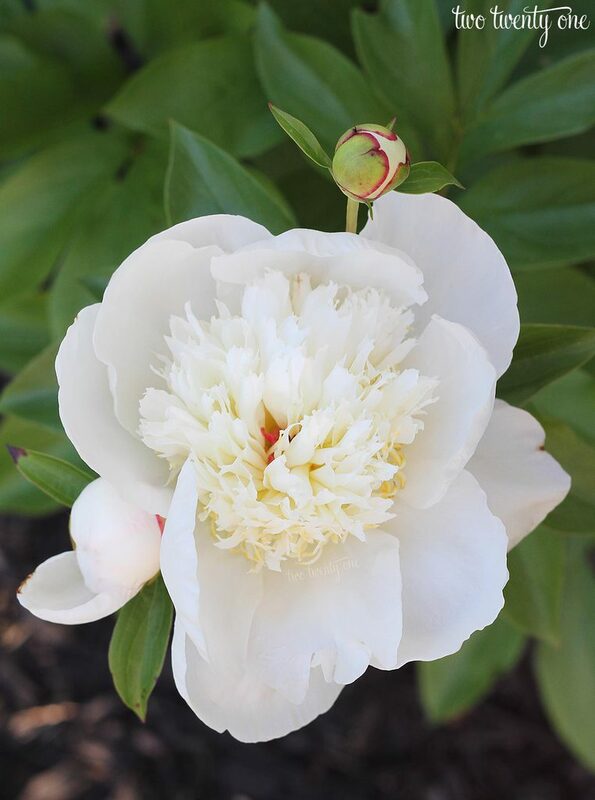 My last peony bush to bloom was the white one. 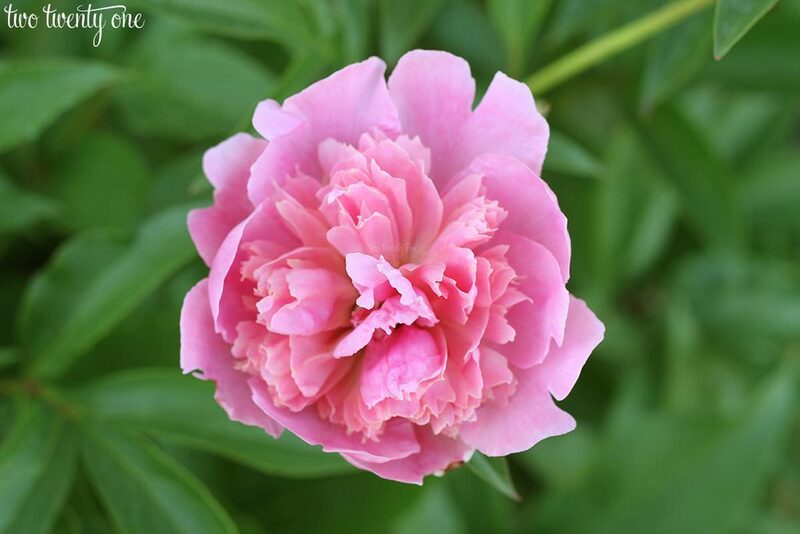 It’s from a mature peony at my in-laws’ house. 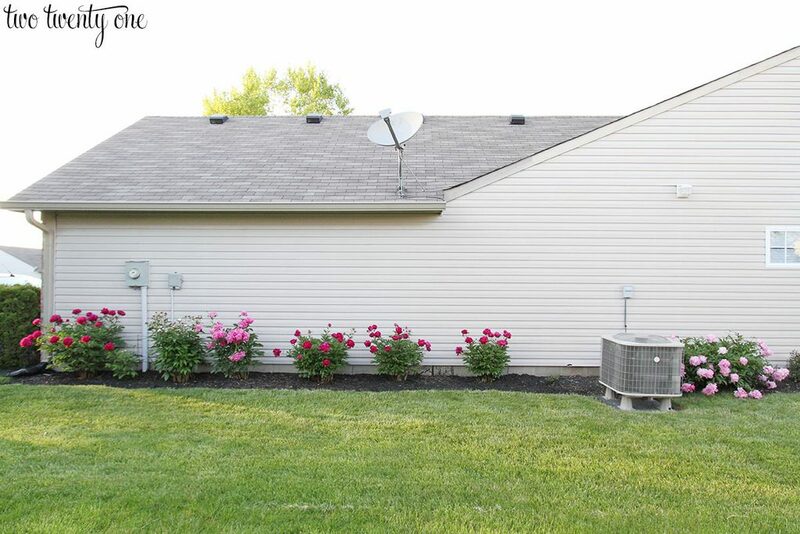 Here’s a look at the side of our house so you can get a sense of their size. 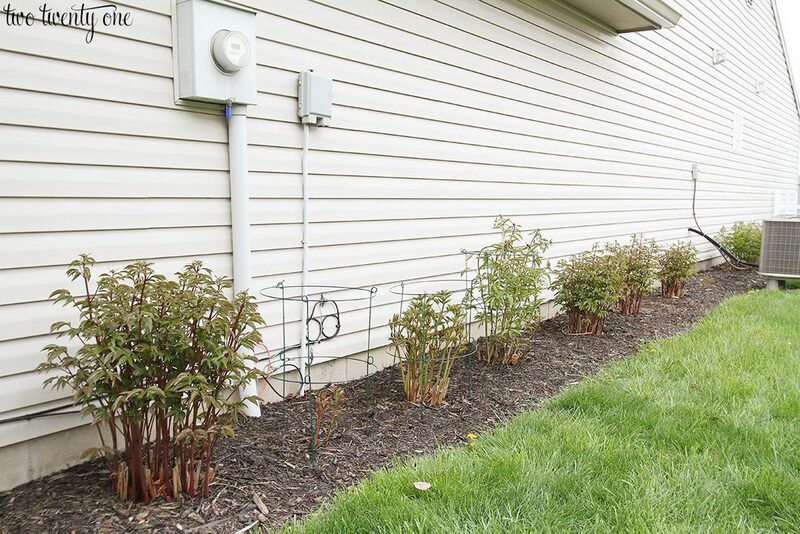 The straggler plant who refuses to grow and bloom is between the last fuchsia peony bush on the right and our air condenser. 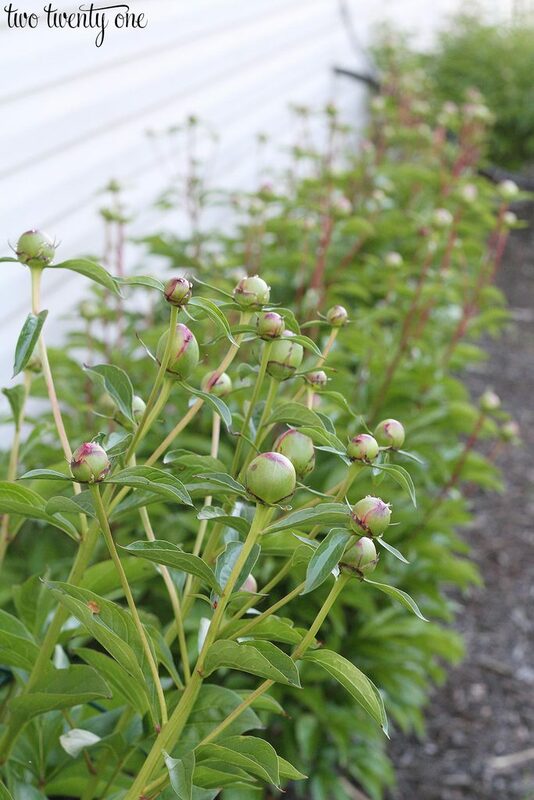 If you have general questions about growing peonies, check out my detailed post HERE! Beautiful pics. mine have not even considered blooming yet. They certainly grew with all the rain we have had in the Twin Cities. 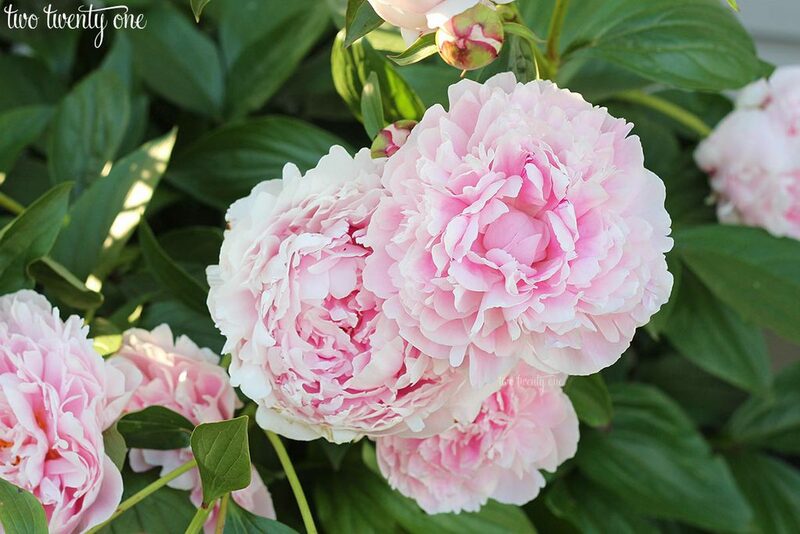 I love my peonies. I have to say they truly are one of my fav flowers next to hydrangeas? 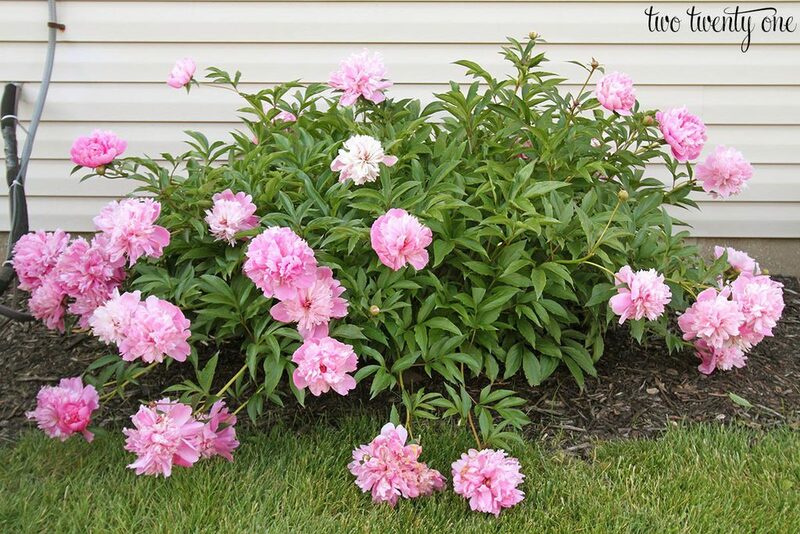 As soon as I saw peonies I knew it was your post. These are beautiful, thank you for sharing! 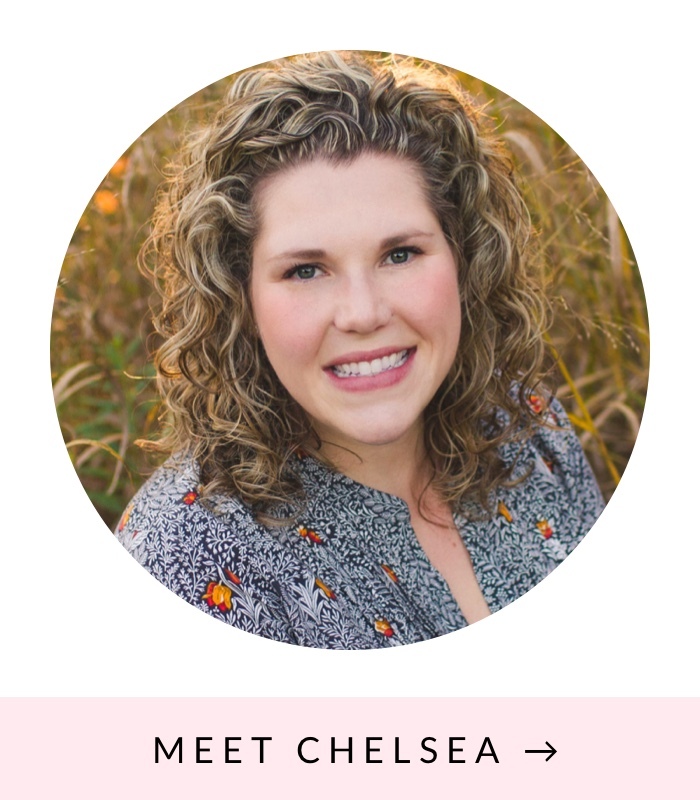 Chelsea ~ All of your hard work is paying off yearly for you. 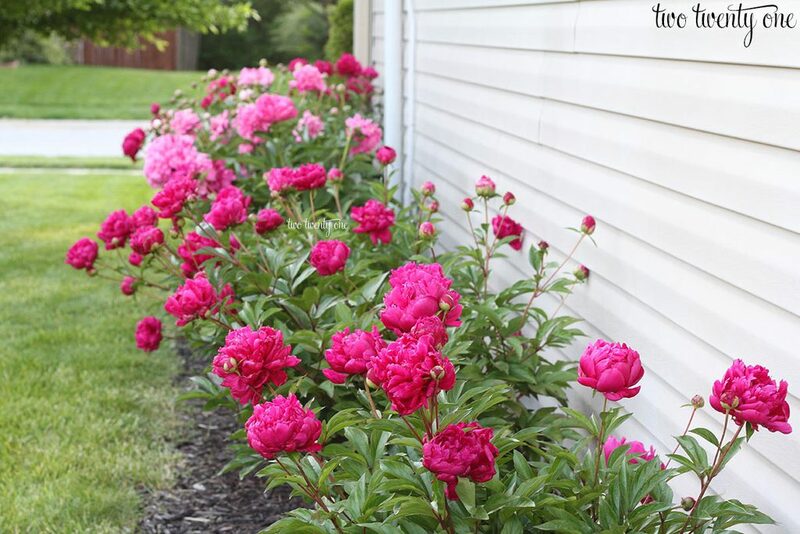 Your peonies are gorgeous!! Ours have tons of buds on them, so we shall wait and see if they will blossom!! 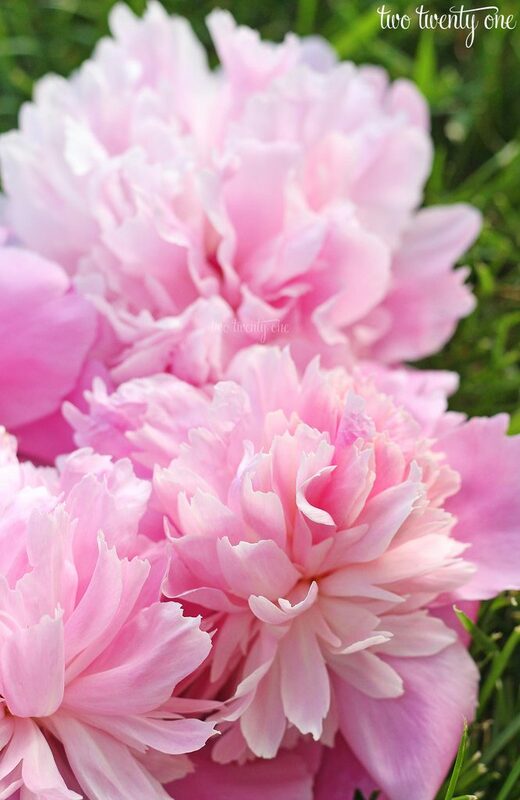 I love peonies so much! Your posts have become an annual tradition among me and my friends since it is so difficult to grow these here in Texas. We all live vicariously through your garden. Buying bunches at the store just isn’t quite the same as growing them yourself. Another bumper crop of gorgeous blooms! Thanks for sharing! 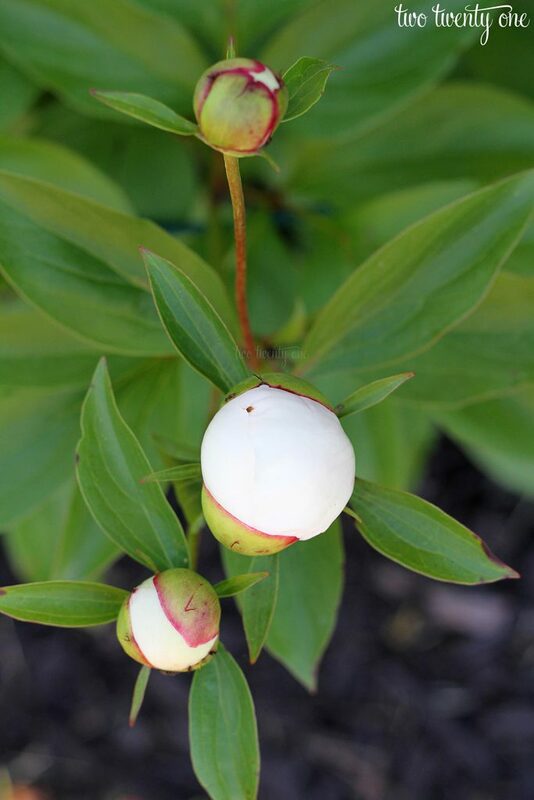 I’ve always been afraid to grow peonies. Yours are breathtaking so, until I gather my nerve, I’ll live vicariously through your garden. Thanks for sharing! 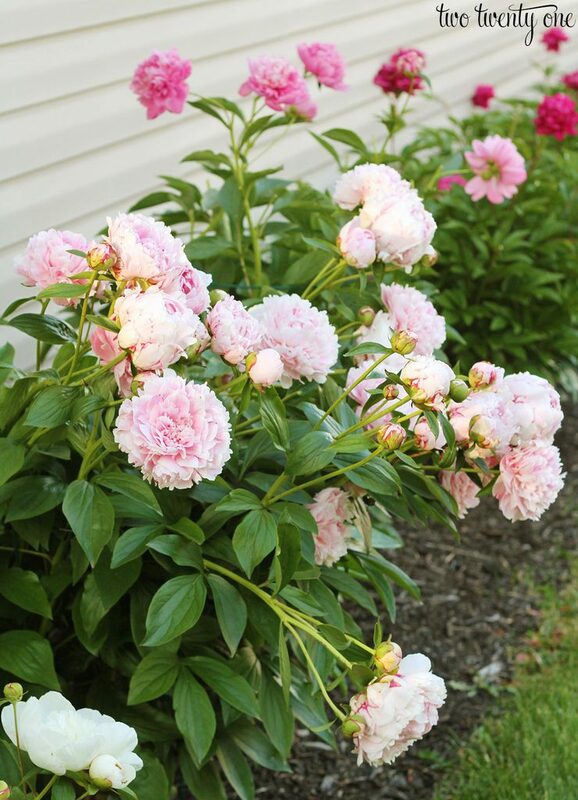 Your peonies are so beautiful!!! I added few plants last year, but only two survived and one of them blooms already. I’ll have to think about supporting cages like yours soon. Thank you for sharing these great photos! What do you do in the fall/winter? 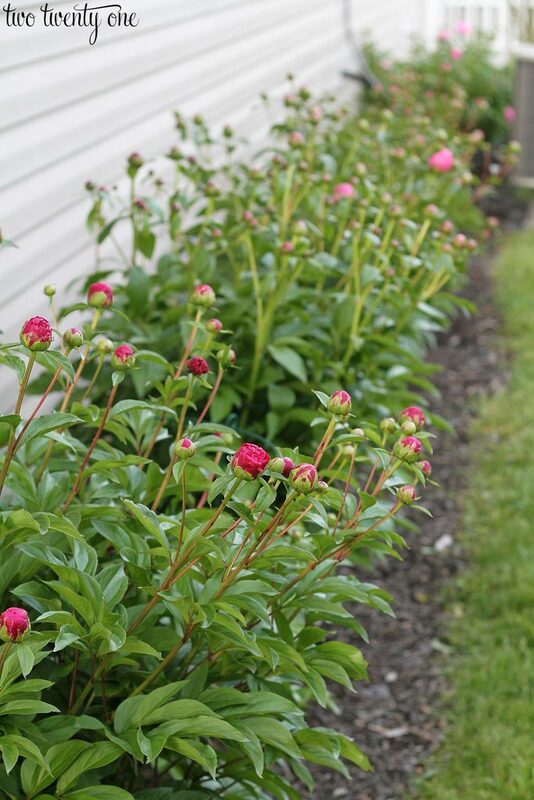 Do you trim them all the way to the soil of just clip the stems and leave the bush? Absolutely gorgeous!!! 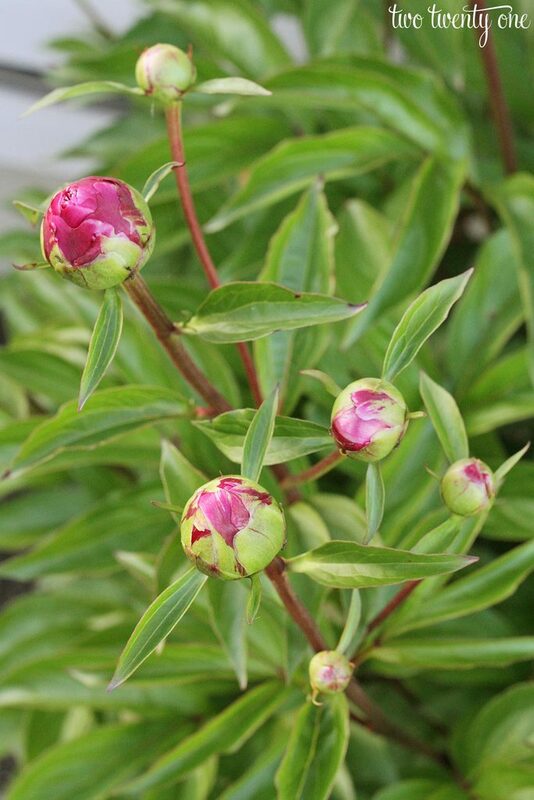 I am so jealous because I live in Texas and it is just too darn hot here to grow peonies. Sigh….I will just have to rely on your pictures every year! I simply adore these flowers. Have several in different colors.